Collingwood Magpies: $5.00 – Is Collingwood too short in flag betting? 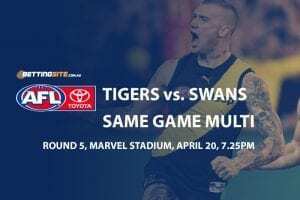 Collingwood will seek to stabilise a challenging start to the season when it faces a young, exciting Western Bulldogs side under the bright lights of the MCG on Friday night. After coming within a kick of the AFL flag last year, Collingwood has lost to Geelong in Round 1, beat Richmond comfortably in Round 2 and lost to the West Coast Eagles in a grand-final re-match last week. 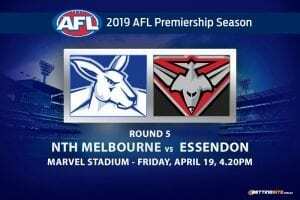 While no one at the Holden Centre will be panicking, this Friday is a must-win affair to maintain their top four ambitions. 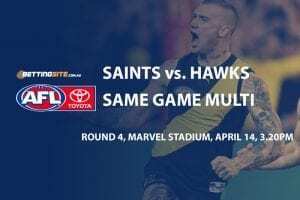 After two exciting wins to start the season over Sydney and then the Hawks, the Bulldogs did the inexplicable in round 3 and lost to the Gold Coast Suns at Marvel Stadium. Losing to the team roundly favoured to win the wooden spoon has put a dent in any early talk of the Dogs returning to finals, but there’s no doubt they’re not a team to be taken lightly. Where does the value lie for punters on Friday night? Let’s take a look at our favourite markets. Scott Pendlebury to get 30 Disposals @ $3.10 – Is there a bonus available for this bet? Pendlebury has been one of the game’s best players for more than a decade and is enjoying an injury-free start to 2019. In a storied, high-quality career, it’s the Bulldogs that Pendlebury performs best against, averaging more disposals against them than any other side. Without a genuine tagger to diminish his influence, he will top 30 disposals for the sixth consecutive time against the Dogs in a Collingwood home game. After staring down the barrel of a premature end to his career, Tom Liberatore has come back with a vengeance in 2019. Many experts said it would be best if Libba moved on from the Doggies, but so far this season he has averaged 28 disposals and looks like a new man. Liberatore thrives in big matches and could sneak under the radar for another big night if Collingwood focus their attention elsewhere. When the Magpies defeated Richmond back in round two, they kicked 17 goals, the same amount we’re predicting this week against the Dogs. 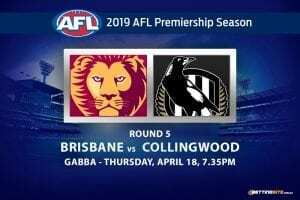 While the Bulldogs will fancy their chances of matching the Magpie midfield, they lack the defensive options to cover the Collingwood forward line, which will be looking to bounce back after being well-held by the Eagles last week. The Bulldogs’ improvement up forward so far this season can be attributed largely to young key forwards Josh Schache and Aaron Naughton. 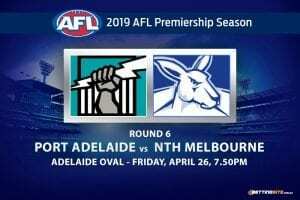 Despite their hot starts, we think they may be blanketed on Friday night by Collingwood defenders Jordan Roughead and Darcy Moore. Roughead is playing his first game against his old teammates and should help keep the Bulldogs forwards quiet. A big victory will help Collingwood get back on track in 2019. After a frustrating display in the grand final re-match last week, the Magpies should be hungrier and more efficient. They have all the fire power up forward and can repel the Bulldogs attacks with a fleet of intercepting defenders. If All-Australian ruckman Brodie Grundy gives his midfield the ascendancy, the score could end up lob-sided. 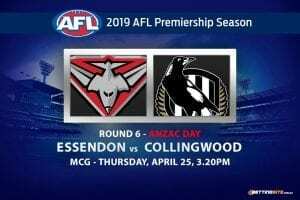 Line Betting: Collingwood Magpies -28.5 @ $1.90 – Which bookie offers the best Collingwood odds? 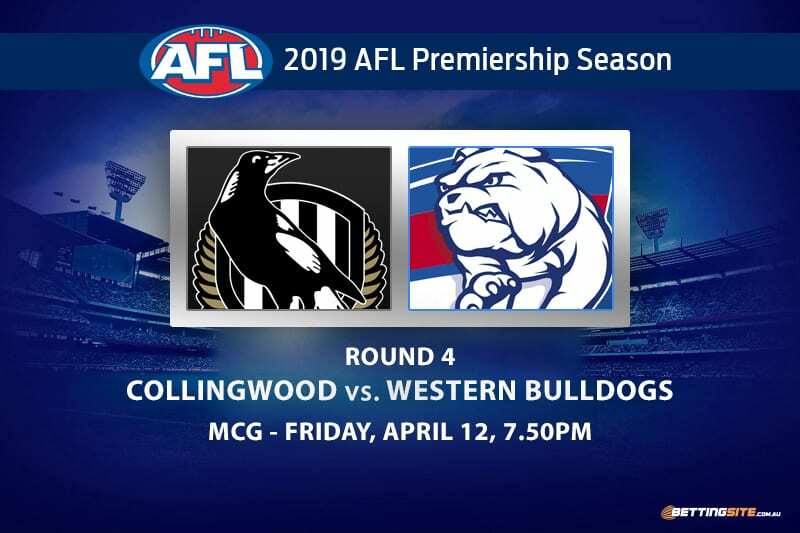 Despite a 1-2 start, Collingwood can still lay a claim to being the best team in Victoria and will show their dominance over the young pups under the MCG lights this Friday night. We expect the Dogs to struggle defensively and for some out-of-form Pies like Mason Cox to find their groove.